A Combined Cycle Power Plant is an assembly of heat engines/turbines that work in tandem. All sections share a common thermal energy source (heat source). 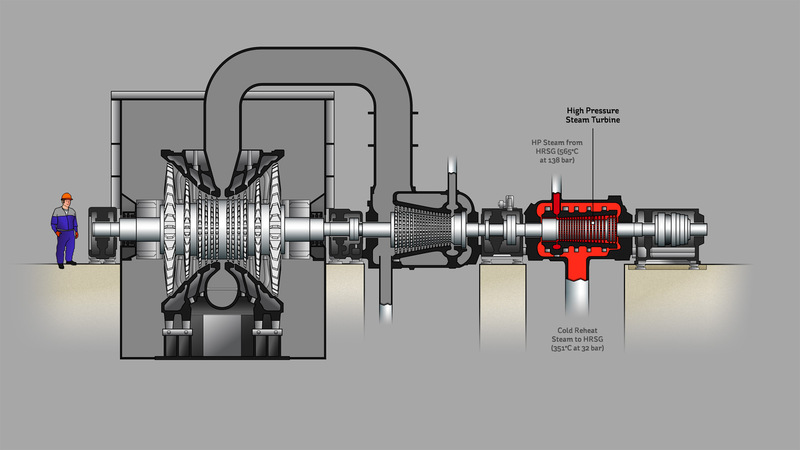 In Aghada, natural gas (methane) is used to run up the first turbine which sends kinetic (rotational) energy to the Electrical Generator via a fixed permanent shaft. Exhaust fumes, carrying heat, are captured by the HRSG and they are used to supply steam to a second heat engine. The second turbine comes into operation once a steady supply of steam is forthcoming from the HRSG. At times only the Gas Turbine is supplying rotational energy to the Electrical Generator, and in this phase the plant is said to be in an Open Cycle with a thermal efficiency of 37%. Without a Steam Generator the exhaust would be open to the atmosphere. However, in the case of Aghada these fumes are captured and supply thermal energy directly to the HRSG via a closed flue. As said previously, the heat is used to convert water into steam which is in turn used to run a second turbine. With both the heat engines running, Aghada enjoys a thermal efficiency of about 57.5%. When both turbines are providing rotational energy to the generator the plant is operating in a Combined Cycle. This is far more environmentally friendly compared to the simple Open Cycle.